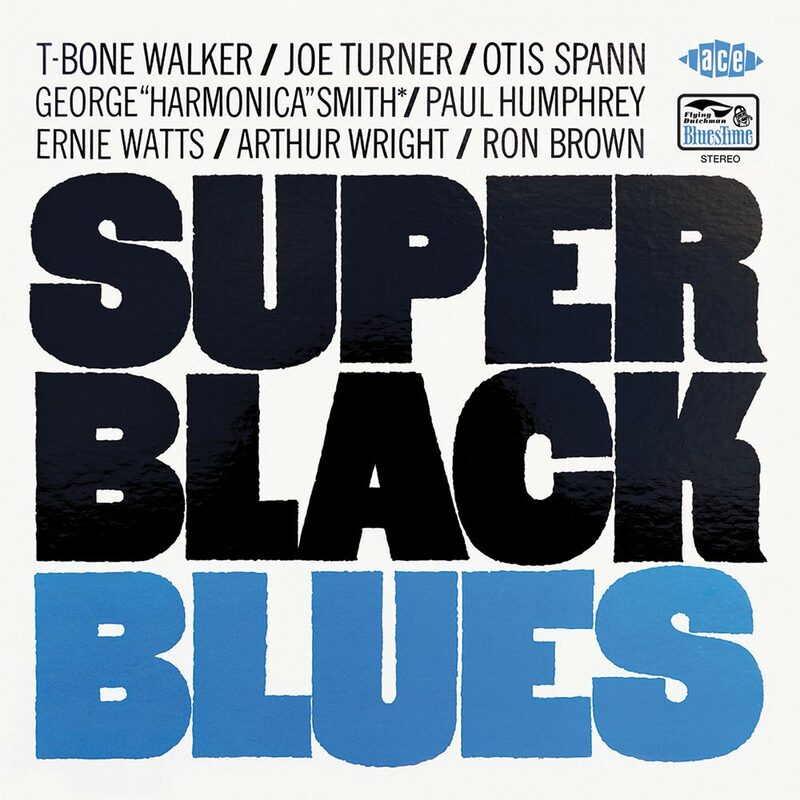 T-BONE WALKER, JOE TURNER, OTIS SPANN-SUPER BLACK BLUES. By the late sixties, blues music was no longer as popular. Psychedelia and rock music were the most popular genres. Groups like The Beatles, the Rolling Stones, Pink Floyd, Cream, Led Zeppelin, The Band, Canned Heat and Fleetwood Mac were some of the biggest selling acts. Along with Bob Dylan and Jimi Hendrix, they were music’s future. Blues music many people thought, represented its past. For many musicians, that wasn’t the case. Many of the biggest names in music acknowledged the influence blues music had on them. Jimi Hendrix, the Rolling Stones, The Beatles, Canned Heat and Fleetwood Mac all were inspired by blues music. They made no bones about that. Each of these artists realised this. Without the blues, they wouldn’t be enjoying the commercial success and critical acclaim that they were. The blues was where modern music began. It couldn’t and shouldn’t be allowed to die. So groups like the Rolling Stones and Fleetwood Mac revisited old blues tracks. This gave the blues a much needed boost. The blues wasn’t dead, it was just sleeping deeply. With a new generation of musicians breathing new life and meaning into blues classics, there was a sudden upsurge of interest in the blues. So, record companies started signing new blues acts. Some record companies even signed ageing blues musicians. This included Bob Thiele’s new label. After leaving Impulse, following the musical equivalent of a coup d’etat Bob Thiele, formed Flying Dutchman Productions. He also believed the blues had a future. So, he started signing some of the biggest names in blues music to his nascent label. Before long, Flying Dutchman’s roster read like a who’s who of the blues. T-Bone Walker, Joe Turner and Otis Spann were all signed to Flying Dutchman Productions and would release comeback albums. In 1969, Joe Turner released The Real Boss Of The Blues on Flying Dutchman Productions. Otis Spann released Sweet Giant Of The Blues during 1969. A year later, T-Bone Walker released Every Day I Have The Blues, in 1970. 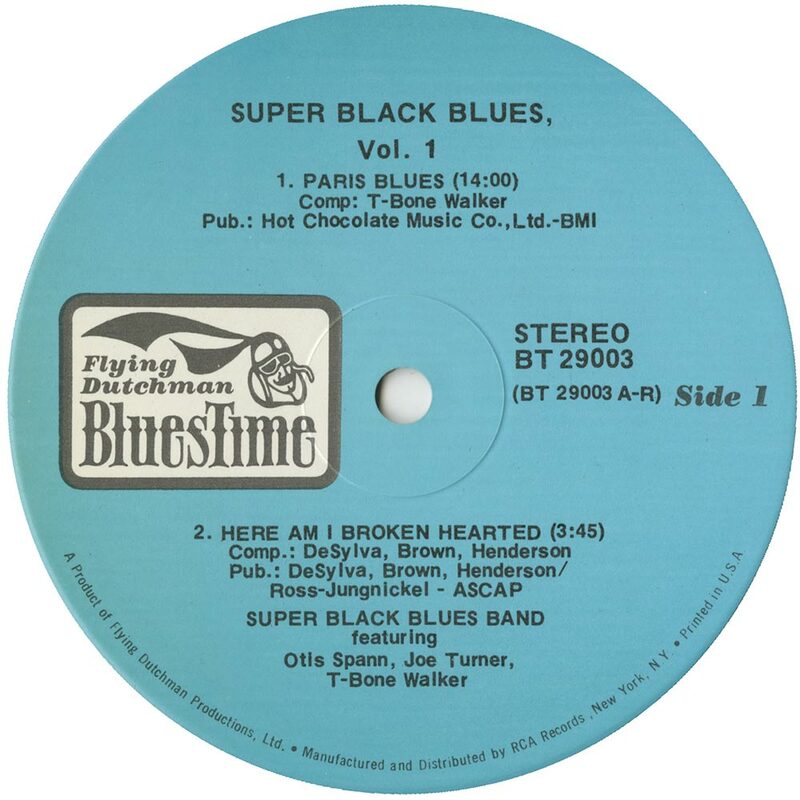 However, a year earlier, in 1969, T-Bone Walker, Joe Turner and Otis Spann collaborated on on Super Black Blues, which was released by Flying Dutchman Productions in 1969. 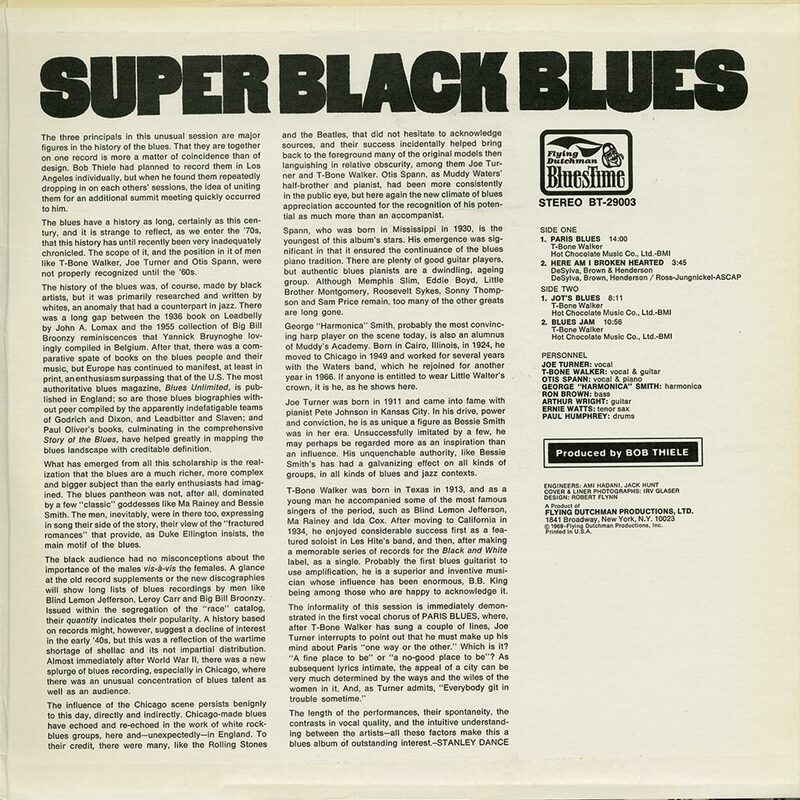 Super Black Blues which was recently rereleased by Ace Records, was essentially a blues supergroup. Joining T-Bone Walker, Joe Turner and Otis Spann were George “Harmonica” Smith, Ron Brown, Arthur Wright, Ernie Watts and Paul Humphrey. For blues aficionados, it’s a tantalising lineup that recorded four tracks. Of the four tracks on Super Black Blues, T-Bone Walker penned Paris Blues, Jot’s Blues and Blues Jam under his real name, Aaron Walker. The fourth track was a cover of Lew Brown, B.G. DeSylva and Ray Henderson’s Here I Am Broken Hearted. These four tracks were recorded by T-Bone Walker, Joe Turner and Otis Spann’s all-star blues’ band. When the recording of Super Black Blues began, the recording studio was full with blues greats. The rhythm section included drummer Paul Humphrey, bassist Ron Brown and guitarists T-Bone Walker and Arthur Wright. Otis Spann played piano, Ernie Watts tenor saxophone and George “Harmonica” Smith blew his unmistakable blues harmonica. Adding the finishing touch was Joe Turner’s vocals. As sessions go, it must have been one of Bob Thiele’s easiest. No wonder. Look at the experience and talent that gathered together in the one recording studio. For Bob Thiele, a huge blues aficionado, this was a dream come true. Although he was the producer, musicians this good, almost didn’t need a producer. They’d been here many times before and new how a session worked. So, for Bob, it was a case of enjoy the show. Once the microphones were setup and instruments tuned, it was a case of pressing the record button and enjoying the recording sessions for Super Black Blues. T-Bone Walker, Joe Turner and Otis Spann’s all-star blues’ band didn’t disappoint. On the release of Super Black Blues in 1969, it seemed to pass people by. That was a shame, given it’s three blues masters at the peak of their powers. It seemed that the sudden resurgence in interest in the blues had been overstated? 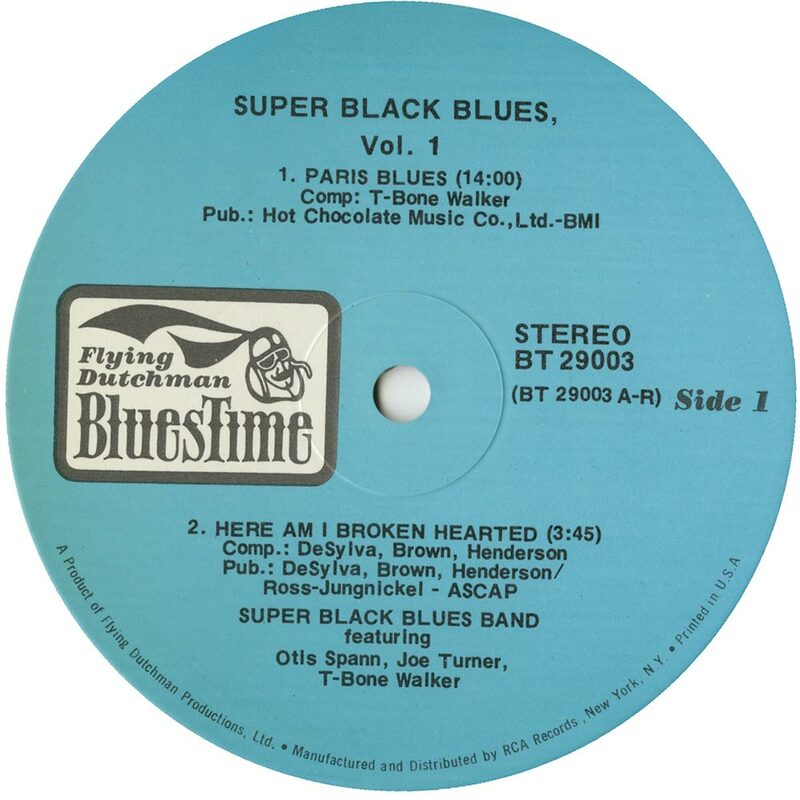 Since then Super Black Blues, has remained a hidden gem that’s talked about in hushed tones among blues fans. You’ll realise why, when I tell you about Super Black Blues. Super Black Blues opens with Paris Blues. It’s slow, moody and bluesy. A probing bass, jangling piano and crystalline guitar combine with bursts of bluesy harmonica. They set the scene for Joe Turner’s lived-in, heartbroken vocal. He’s hurting as he sings: “I love my woman, but she doesn’t love me.” Behind him, the rest of the band lock into a groove. They feed off each other. It becomes a game of daring do. Whatever Otis Spann can do on the piano, T-Bone Walker can do better on the guitar. All the time, bassist Ron Brown provides the heartbeat. Chiming guitar, flourishes of piano and bursts of bluesy harp provide the backdrop for Joe’s soul-baring vocal. Everyone gets the opportunity to shine. Not just T-Bone Walker, Joe Turner and Otis Spann. There’s plenty of time for that. After all, this is a fourteen minute Magnus Opus, where three blues’ greats and their friends get the opportunity to showcase their considerable talents. T-Bone Walker’s crystalline guitar opens Here I Am Broken Hearted. It sets the scene for another heartbroken vocal from Joe. He leaves gaps, which are filled by Ernie Watts’ blistering, riffing tenor saxophone. Ernie’s playing raises the bar. Suddenly, everyone is pulls out the stops. They lift their game. Especially, T-Bone’s guitar and Otis’ piano. They’re played with flamboyant flourishes. They’re the perfect foil for Joe’s despairing, hurt-filled vocal. Just T-Bone Walker’s opens Jot’s Blues, as the arrangement gradually unfolds. Deliberatelym he picks at the strings, before a dramatic flourish signals the band to enter. Otis Spann plays flamboyantly, while the rhythm section lock into a bluesy groove. T-Bone unleashes some brief, bluesy licks. Then Joe’s grizzled, weary vocal enters. It’s accompanied by Ernie Watts’ scorching tenor saxophone and Otis’ piano. They seem to drive each other to greater heights. It’s a case of anything you can do, I can do better. Soon, T-Bone gets in on the act. Effortlessly, his fingers fly up and down the fretboard, his guitar chiming all the time. Meanwhile, Joe unleashes a vocal that’s full of sadness and emotion. His timing is perfect. He’s also quite happy to allow others to shine, during this eight minute epic. Playing starring roles are Otis, Joe, T-Bone and Ernie Watts, who are responsible for a blues masterclass. Closing Super Black Blues is Blues Jam. Straight away, the rhythm section and Otis’ piano get to work. They drive the arrangement along. T-Bone unleashes bursts of bluesy guitar. When Joe’s vocal enters, he’s got the blues. The band try to lift his spirits, as they unleash a jaunty arrangement. Everyone does their best. Especially, George “Harmonica” Smith, who blows his best solo. He never misses a beat. Neither does Otis as he pounds his piano. 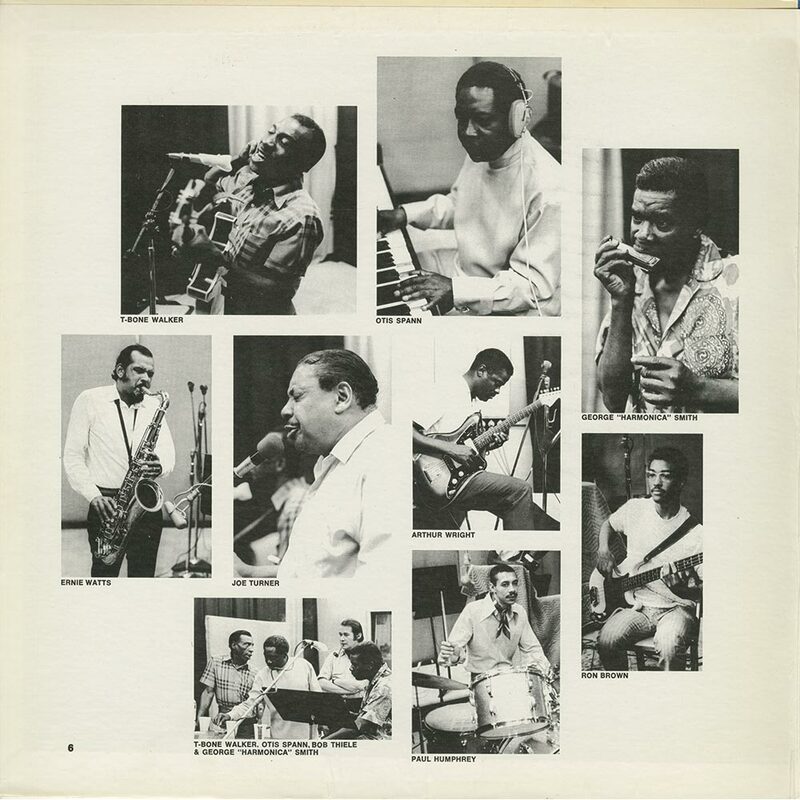 Accompanying him is Ernie Watts, who seems to bring out the best in Otis. After that, Joe returns, and takes on the roll of MC. By then, the band are on a roll. They’re at their tightest, as the music just flows through them. A scorching saxophone, pounding piano and rhythm section accompany a lovestruck Joe as the band drive the track towards its crescendo. They’re determined to close Super Black Blues on a high. This they do and then some. Without doubt, they’ve kept the best until last. Often, when a group of top musicians get together, egos get in the way of the music. Not on Super Black Blues. T-Bone Walker, Joe Turner and Otis Spann were too long in the tooth for that. They’d spent a lifetime playing the blues. As the sixties drew to a close, blues music had been in the doldrums. Not any more. A new generations of music had acknowledged the influence blues music had on them. Jimi Hendrix, the Rolling Stones, The Beatles, Canned Heat and Fleetwood Mac all were inspired by blues music. They revisited old blues tracks and brought new life and meaning into them. This lead to a resurgence in interest in blues music. Record companies were now signing new blues acts. Meanwhile, Bob Thiele’s Flying Dutchman Productions took a different approach. They went looking for blues greats. This described T-Bone Walker and Joe Turner, who were approaching the veteran status. Otis Spann was different. He was one of a new breed of bluesmen. He was only thirty-nine when he recorded Super Black Blues. However, Otis loved life. Too much it turned out. Otis faithfully lived the life of a bluesman. This meant a regular diet of wine, women and song. Sadly, this caught up with him in 1930. He died age forty. That’s much too young. A hugely talented pianist never got the opportunity to fully fulfil his potential. Listening to Super Black Blues, which was one of Otis, last recordings, one wonders what heights he’d have reached? Going by Super Black Blues, the sky was the limits for Otis Spann. 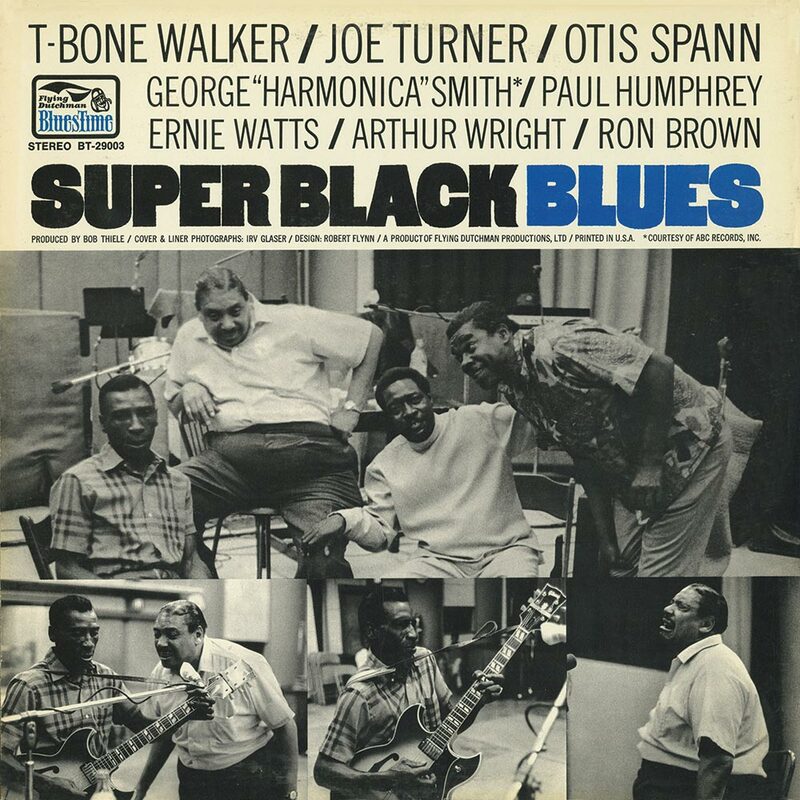 Sadly, Super Black Blues was the only time T-Bone Walker and Joe Turner ever recorded with Otis Spann. Although it features just four songs and lasts thirty-three minutes, Super Black Blues is an essential purchase for anyone interested in the blues. Not only does Super Black Blues feature T-Bone Walker, Joe Turner and Otis Spann, but an all-star band. Among them are tenor saxophonist Ernie Watts and bassist Ron Brown. They play their part in the sound and success of Super Black Blues, which was recently rereleased by Ace Records. Super Black Blues is one of the best blues reissues of 2014 and belongs in any self respecting record collection. ← MAN-CALL DOWN THE MOON.